My mom whats apps me every single morning between 5am and 6am to say good morning and this morning I woke to “rest in peace Madiba”. I immediately put the television on, and realized the day that I knew was inevitable, had arrived. What a sad, sad day for our country but what a glorious legend Madiba was and what an example to us all. I can only pray that each of us, everyday, tries to be more and more like him. If we do this, this beautiful country of ours (and the world) will be a better place. 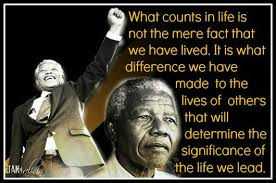 Tata Madiba, you will be missed and we all love and admire you FOREVER…..